Yep D1 Mini's work really well. With a PLCC socket and some matrix board you can make a very small plug on device. Tried out the line blur filter thing and I must say, what a jump in clarity! It looks fantastic, as long as you don't use scanlines. Using scanlines can really highlight the fact it's not displaying at the monitors native res. The line blur can help hide it. I think if we ever get a 1080 profile, this will look absolutely fantastic. The URL for the ESP8266 definitions is still working fine here. The Github project description also still links to it. Maybe a server issue yesterday? Don't see why it shouldn't work. I got ESP8266 working again on the IDE. From a web search other people have had this strange issue. Having a strange issue since there was WiFi changes with Firmware. Does not seem to show GBS UI and if have seen it I can't adjust anything (on my LG G4 phone) but using an old tablet I connect fine and could adjust? I will try rebooting the phone. I don't link the GBS to my home WiFi as I am not sure it picks up the router downstairs as when in have added home SSID and password I cannot connect (then in have to reprogram to clear the settings). So on my phone I disconnect from my home WiFi and connect directly to the ESP8266 WiFi. It works in either mode. The DNS lookup seems to be really slow initially. Once it sent the site, all following lookups are fast. I'm no expert on this stuff, just following the examples and documentation that's available. It seems like the ESP8266 doesn't cope well with mediocre WiFi conditions, but that is the best I can tell. I'd advise you to wait longer for the site to show up. It will eventually. Strange. It works fine on phone's 'Chrome' browser. It just seems the internal browser is now broken? I can get the UI up but it does not do anything. I will stick to Chrome from now on. I use websockets for all interaction. Websockets could be blocked in some configurations. I'm just starting to look into getting one of these, as my OSSC isn't perfect, and my DSC 301 HD is not really what I was hoping for. Is there a resource that describes the GBS 82xx boards with a concise list of features, supported video modes/formats, and example applications? What is the max scaling resolution? 1920x1080? 1920x1200? 1600x1200? Can the DE-15 input also accept YPbPr, and is there auto-detection of that as well? Is anyone making cases for these? Is there an IR sensor for using something like an OSSC remote to navigate the on-screen menu system? How secure is the ESP8266 with the socket adapter? Do these boards have the capability of decoding CVBS and/or S-Video? At what point does the number of required/recommended/optional hardware modifications--replacing SMD caps, adding resistors/ferrite beads, removing pots--warrant building a custom PCB using the same components? Are the HDMI-output variants documented/supported? (And do they support YPbPr, or just RGB? The wiki you've read is pretty much the only resource at the moment as no one else has put much time or effort into this device. Max supported resolution right now is 1280x1024, but hopefully there will be some form of 1080p output in the future. No idea about progressive transitions like 480p, but 240p -> 480i and vice versa is instant. There are 3D print designs for this scaler on thingiverse. At the moment, as far as I know, there is no IR sensor as the menu is accessed via web browser, not on screen. The socket adapter isn't super secure. It will stay in place, but if you knock the scaler, for example, it can quite easily come loose. I secure mine with a drop of hot glue. Works a treat. No S-video or CVBS support right now AFAIK. The only hardware mods that are required are replacing the 2 sync SMD caps, and the 100ohm resistor on the sync line. There are other caps you can add to reduce interference, but they are not strictly necessary. The HDMI variant is supported. It's the same scaler, it just has a built in HDMI encoder instead of a VGA output. I've literally just assembled one today, and it works fine. It's not a perfect solution for everyone, not by far, but that's not the goal here. The main attraction of this device and this project as a whole, is the price. It's a ~$30 scaler that can come close to the OSSC and Framemeister quality with a bit of modding. Is there someone we can get involved in this project who can design a new PCB around these chips that can take advantage of both the analogue and digital output from the DAC and has the ESP8266 baked in (or socketed)? A 1080p output preset is technically possible today, just up the output vlines to 1125 or so and the auto timing tool can adjust the rest. It won't look that great though. For that, it requires a bit of tuning work. My display doesn't support the resolution, so I can't really do it right now. Not possible by default, as the hardware doesn't route the incoming green channel to a SOG input. Only the 3 RCA input does that. IR support isn't included, but someone once did a bit of addon code for this. There is a rudimentary OSD available to use. I'd like to skip working on this though, as I don't have remotes or sensors, the code would be complex, and I assume most people won't even build this. The web ui is more convenient and more powerful, and it doesn't require buying / building more things. I built 2 of these, and if you take care preparing the socket, it will be very reliable. Once they're clipped on, they hold well. Requires demodulation, which very little all in one chips support. The TV5725 doesn't either. Those don't make much sense. The price in material and labor easily pushes one final device into the > $100 range. The benefit of direct digital out sounds nice, but the DACs of the TV5725 are of very good quality. Picture quality of the analog output stage is excellent, and it's more likely to loose definition earlier in the processing pipeline. The one HDMI board I have doesn't support YPbPr, unfortunately. A hardware modification could be done, or simply combine a regular GBS with a VGA to HDMI dongle (also has the extra benefit of allowing to add audio). If you have an OSSC, then imo that device sets a very high bar. Don't be disappointed if the GBS can't live up to its standards. The GBS has some strong points besides the price, but pixel perfect integer scaling isn't one of them. When the time comes, let me know, and I'll give you an outline of the program flow and some design considerations. This will aid you better than me trying to explain what everything does. 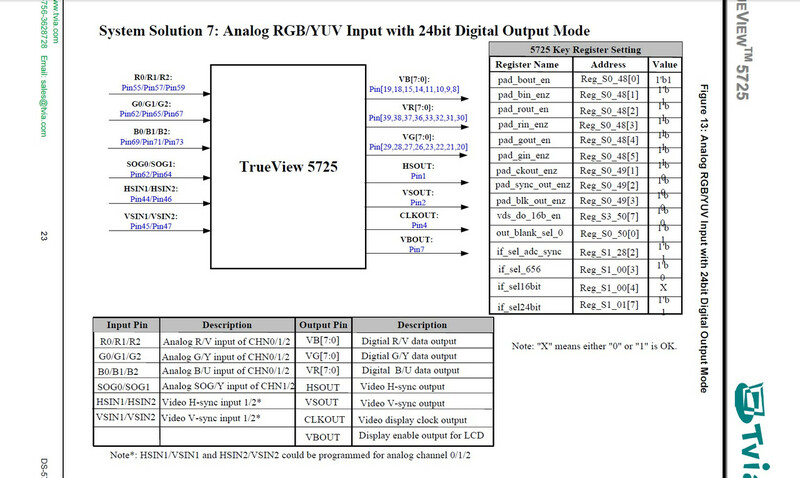 The TV5725 is a very complex device, demanding a complex configuration. The entire web ui, websocket, HTML + JS, all on an ESP8266 thing also needs some love! Yes, the GBS layout seems to allow modding this with a flex cable connector or the likes. Not only are all the required pins on this most convenient side, they're also (almost) all floating. At least one major problem: One of the pins is dual purpose, sharing a digital I/O bit with the debug bus output. I'd need to work without the timings from that pin (doable.). Yep, that should be it. The chip has what they call the "test bus", which can be configured to sample values from various subdevices. The samples land in S0_2E + S0_2F (possibly one more byte somewhere else), and can be read via I2C. Also, the 2 (or 3) test bus result bytes can be sent over the digital I/O pins. One of these pins is connected on the GBS, and it's the one for S0_2E. I use this to send the SyncProcessor SOG VSync pulse data to the ESP8266, to very precisely measure the interval. Working around the issue should be doable. For example, the pin could stay dual purpose. We just do the measurements as usual, then turn off the debug stuff and output that blue data bit again. The display will have a wonky blue bit in it for a second, that's it. so that would be pin 4 then, the clock output, which doubles as GPIO bit 7? EDIT: if you're using the SOG processor as a v-sync timing source to determine frame rate, where does that leave you when using inputs with separate sync? The digital I/O pins are those 3 x 8 pins that can be digital video inputs or digital video outputs. The GPIO are something else entirely, and I don't actively use any of those. For separate sync inputs, I don't measure the interval. I don't have to, because I just bypass everything anyway. But the test bus is wired to a ton of data sources. I'm sure there's another VSync interval in there to measure. Yeah, though I haven't tried to figure out how the other pins relate to the test bus data. I can see that it has some internal timing and updates itself regularly. It's totally unknown how that timing works, and there are some cases where I'd like to know if the data on the test bus is stale or not. My guess is that it updates on the HSync event, but I'm not sure. If it is the HSync, an I2C read can potentially read stale results. There is 64 microseconds. Not much, but maybe 2 reads fit in there. Those pin drivers for the digital I/O are powerful! They can push very high frequency flanks out through traces and cables, and they still arrive at the ESP8266 as square waves. Talking like 50Mhz here..
Oh and yeah, be glad the register definition at least mentions a few test bus register bits. Do you have experience constructing digital video stuff? If I wanted to try receiving digital RGB (say spliced off from a PSX's DAC into the GBS), would it suffice to connect just a couple color bits and the required timing signals? Yeah, I guess I actually need to build something to know if it's feasible. A PSX digital to pixel perfect scaled VGA with auto format switching (320px and 256px wide games, 384 is also used) would be awesome, I think. I've been fiddling around with the GBS-8200 and gbs-control for a couple of days now and am very impressed, so thank you very much for your hard work to everyone involved in the project. My TV doesn't like the default modes over VGA (with the exception of 640x480, which works out as 720x576@50 for me - presumably as I'm a PAL user) so I'm using a Mini VGA2HDMI to convert the signal to HDMI. All in all I measure 2-3 frames of lag, which I can't personally notice when playing (unlike my cheap generic SCART to HDMI box which I've measured at 7-8 frames of lag on the same TV). I still have some issues with faint noise but I think that's from my current power supply. When I plug the GBS-8200 and Mini VGA2HDMI into a powered USB hub instead I only have very faint shimmering noise in the background but the hub doesn't provide enough power to reliably power the NodeMCU (the web interface drops out). I did initially have extremely bad noise (scrolling diagonal bands moving through the image) but this all seemed to come from the NodeMCU which shares the same power as the GBS-8200 (if I let the NodeMCU initialise the GBS-8200 and then yanked it out of the board the noise entirely vanished). I fixed it by soldering a 100uH inductor in series with the power into the NodeMCU; I'm not sure if this is the correct solution but it completely fixed the issue and it's the only inductor I had in my parts bin! You will also need the appropriate Unix-like programs (gzip, rm, sed etc) installed somewhere in your path. I had most of them already thanks to WinAVR bundling most of them however its version of sed seemed to be out of date (it didn't like the -i parameter) and so I installed an updated version from the gnuwin32 project. xxd is included in the Windows version of vim. One thing that really threw me is that the Unix-style LF line endings was preventing something from working properly - after recompiling the project the web interface would refuse to load with the browser complaining about an invalid compression scheme. Opening and re-saving the webui.html with Windows-style CR LF line endings before converting to webui_html.h fixed this issue. Change variable names where appropriate - I needed to change three such loops. Clunky code, sure, but cheaper than buying a new phone and more practical than having to run to my PC on the other side of my flat every time I wanted to make a settings change. If you have a 3.3V connection between the GBS and the ESP8266 board, remove it. The supplies should be separated. 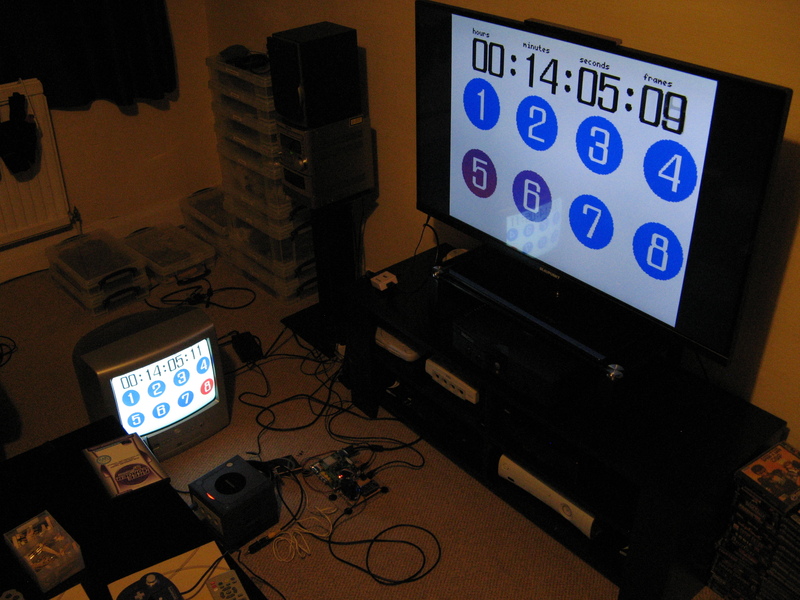 I have been doing A LOT of testing of my GBS-Control setup with different devices, especially MSX-Based computers, using a RGB adapter I built (based on IL1883, a low-power LM1881 clone). The advantage of using the IL1883 on the RGB adapter is that it is so low-power that it can be powered from the ~3V on the "Slow Switch" pin on the RGB port, eliminating the need for a separate power source. Anyway, the adapter/GBS combo works GREAT on most of the machines (13 tested so far), from multiple manufacturers (Sony, Panasonic, Toshiba, Sanyo, Philips, etc). However, on some of them the image occasionally blinks for a fraction of a second. I managed to capture this on video during one of the tests, linked below. The machines affected have nothing in common: different manufacturer (Sony and Gradiente), different video standards (NTSC on Sony, PAL-M on Gradiente) and video circuits (Sony follows the MSX standard, Gradiente has some differences on pinout). I thought about this being a power issue, but even with external power the problem persists on these machines. Do you have any idea on what could be causing the issue? The number of machines affected is low (2 out of 13), but this has been puzzling me. Also, a tip: during my testing I found that on some machines I couldn't get a video signal at all. After some experimentation, me and a friend determined that replacing the 100 Ohm resistor on the sync inputs with a 3V3 Zener diode + 4K7 resistor pair solved the problem and increased compatibility. The diode keeps the voltages on the "safe" level for the GBS. Also, I have seen no negative effects of this change on other MSX machines or consoles like the Sega Mega Drive and Sega Saturn. PHC-70FD - For this one to work the replacement of the 100 Ohm resistor with the 4K7 + Zener pair on the sync inputs of the GBS was needed. Also, the MA-20 "version up adapter" (upgrade cartridge from MSX to MSX2) works fine. 1080p support is in. Go wild!